As soon as the package labelled Corsair arrived in my mail, I knew I was in for a treat and I was right! I've been a big fan of this band and have been following them since their first Ep. So far this band has been delivering 2 excellent EPs, and this one is no different. The third offering is one of those rare but welcome CDs that grabs you from the very first track and holds you enraptured through the entire recording. Stirring opener “Agathyrsi” catches fire quickly, with the tag tandem of Paul Sebring and Marie Landragin’s guitar playing well off of each other. Corsair is rooted in a somewhat jam-era, but still the band’s intricate, but ear pleasing melodies and quite polished solos guarantee you rarely accuse them of self-indulgence. The sound on “Chaemera” , ‘Mach” and “Falconer” is very reminiscent of Thin Lizzy, and this is most certainly not a bad thing. The leads are beautifully weaved into every song, The topics of the Corsair songs linger around Greek, Roman and Egyptian mythology. The Philip Glass-intro on “Path of the chosen arrow” is slow and practical and then builds things up heavily enough before it all falls apart into a storm of melody and musical brilliance. They only have to fine-tune the vocals on “Gryphon wing” and “Path of the chosen arrow” whose raw delivery fir the music but lack eventually variety. The nwobhm influences aren't very pronounced, but it's still there in songs such as “Mach”, “Of kings and cowards” and “Gryphon wing”. “The desert” is an atmospheric piece, evoking both Sigur Ros at their most ‘spacey’ and Slough Feg circa Atavism. Although it's nowadays extremely hard, Corsair manages to be an innovative heavy metal band that is able to put lots of variation into their songs. 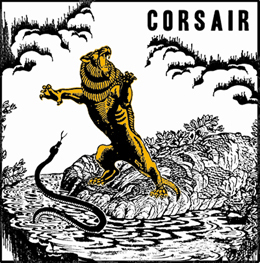 Due to the fact that Corsair is rich in variety, filled with passionate twin guitar playing and offering a tasteful sense for strong hook lines it's a very enjoyable album and extremely recommendable for all fans of 70's heavy rock (Wishbone Ash, Thin Lizzy, Ultra) and late 70's/early 80’s metal (Riot, Priest, Ufo, Maiden). Released on the one and only Shadow Kingdom label (Sinister Realm, Iron Man, Revelation, Argus, Pale Divine, ect…) so go there and place your order. For news and info’s about Corsair, check their website http://www.skykrakken.com.